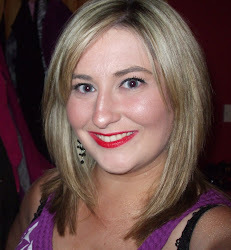 Irish Beauty/Fashion Bloggers/Vloggers Secret Santa 2013- All you need to know! 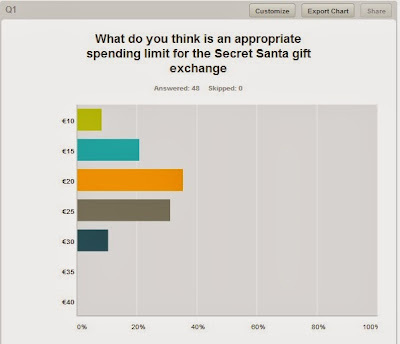 Ok, as promised, I am delivering the results of the first ever #irishbbloggers Secret Santa survey! 48 of you lovely ladies cast your votes and I am delighted today to be able to announce how our Secret Santa swap initiative is going to work. There has been so much interest in this initiative which is absolutely brilliant to see, and it just goes to show what a great community spirit there is amongst us Irish Beauty and Fashion Bloggers and Vloggers! Whether you are a long time blogger or if you are just new on the scene, this is a brilliant way to be involved in something, befriend new people, pick out a surprise present for someone you may or may not know AND have a mystery present delivered to you! 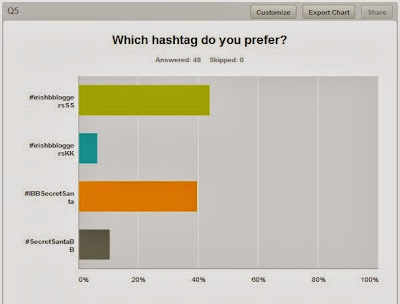 So without further ado, I will first reveal the results of the survey! This question was pretty much neck in neck all week long, and it was a tie between €20 and €25 for a couple of days during the week. Thankfully this morning, the €20 limit has edged ahead slightly and now that is what we are going with- so you have €20 to pick out a Secret Santa present for a fellow blogger. Not too steep in these recessionary times thankfully! I have specifically limited this SS 2013 mission to Irish bloggers because we will all be incurring similar postage costs. 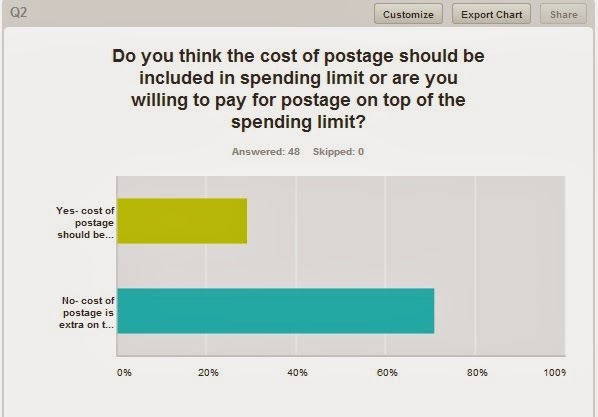 I put it to the people whether you all believed the cost of postage was in addition to the spending limit, or included in the spending limit, and you rather overwhelmingly voted that the cost of postage is not included in the spending limit. 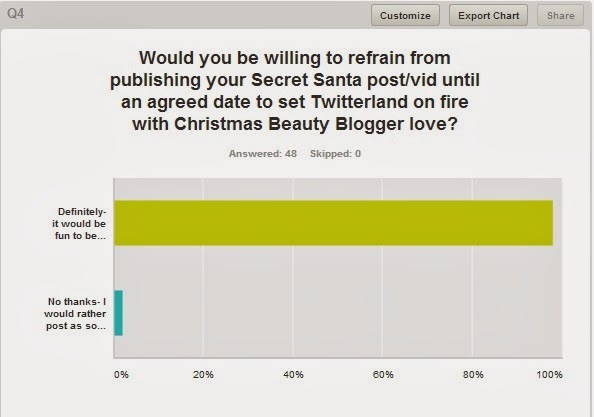 I asked you if you were willing to hold off on posting about your Secret Santa experience/haul until a certain set date so that we could all publish on the same date and set Twitter and Facebook on fire with a mass Secret Santa unveiling. I personally think this would be awesome and great fun and it would be cool to see what everybody got on the same day, to see what people picked out for each other, it would be like a team effort. I was delighted when all bar one person thought it would be fun to hold out and post on a given date, and I am delighted to announce that that date has been set at Sunday, 22nd December 2013. You can have your post or vid prepared or filmed in advance of this date but if you could hold off on publishing or uploading until the 22nd, it will feed into the mystery and intrigue! I don't know about you guys but there is nothing I love to do more on a Sunday evening than read haul posts or watch haul videos, so I think this would be a neat little touch. Lastly, I think it's important that we have a hashtag for Twitter so we can drop little hints and scope out the competition and just chat and enjoy the bants about all things related to our Secret Santa mission- so I asked y'all which hashtag you would prefer, and the winning choice was '#irishbbloggerSS'. Simple but to the point and it won't waste too many of those precious 160 characters. 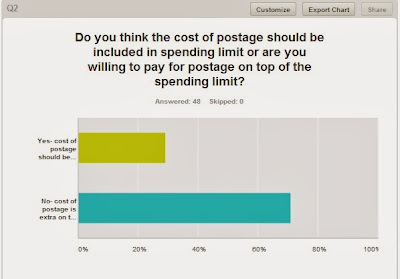 The spending limit is €20 and postage is not included in that spending limit. You need to make sure to have your Secret Santa gift popped in the post by Friday 13th December, in order to make sure that it arrives before the huge reveal on social media on Sunday, 22nd December. When you are talking about this on Twitter, please use #irishbbloggersSS so that we can all follow each other. Simples. You can comment below to let me know you are interested, or chirpy chirpy tweet tweet me at @totalmakeupadd. Please send me the postal address that you would like your present delivered to- whether it is your home address, your work address - whichever is most convenient for you in the weeks coming up to Christmas- to my personal email which is totalmakeupaddict@gmail.com. I will be taking names from today until Wednesday 20 November, and you will have received an email from me by Friday 22nd November with the details of who your Secret Santa subject is! Remember, it's like Cluedo, if we don't let the cats out of the bags, we will all suspect each other and it will make the experience all the more intriguing! 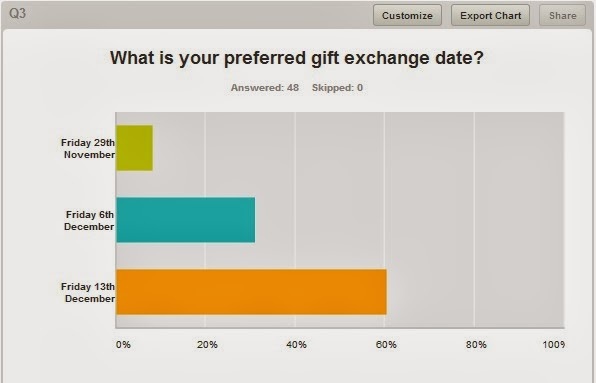 I will be picking your Secret Santa and gift subject based on numbers and a Random Number Generator from random.org- it won't be the same person that you are buying for that will be picking out your pressie! I'll be on hand at any point to answer any questions or queries you have so don't be afraid to ask. You might also want to send links to your blogs so I can send them along with your names and address to your Secret Santa so they can use the information to get an idea of what you like (just in case you didn't already know!!) and to link your blog/channel in their post. Again, this is open to all Irish beauty/fashion bloggers/vloggers so get your blogging friends on board, spread the word and spread the love! So get your name and preferred postal address and any other relevant info to me asap and I'll take it from there! Hope you are as excited as I am!! Such a great idea I'd love to take part but I'm going on my hol in December! Aw that's such a pity Sarah, but there's always next year! This sounds like so much fun, I'm definitely in! I'm in mail on the way! this is such a fun idea. Sending on my details now! YAY!!! So excited for this, I love Secret Santa's - so much fun! This sounds like great fun! I’m in, will mail you now! Love this idea, count me in. Hiya Aisling just checking you got my mail with my details?? Oh no!! I was away and it looks like I missed it :( It'll have to be next year so! When we post our SS pressie, do we include a note to tell them who's sent it? Benefit Advent Calendar- Countdown to Love! !